PRESIDENT Rupiah Banda has demanded that Zambian Airways pays back the US$30 million debt that it owes public institutions. The president said that with such a colossal sum of money, the Government would be able to improve the health and education infrastructure in the nation. President Banda said this when he addressed MMD cadres who marched to State House to show solidarity with his leadership in Lusaka yesterday. He said that it was not him that asked the directors of Zambian Airways and its shareholders, Post Newspapers, to borrow public funds and neither did he ask the lending institutions to offer such resources to the airline. “Now that I am president, I want this money back. With $30 million we can build schools and hospitals. Forgive me we want this money back,” Mr. Banda said. President Banda said he had information that Post Newspapers had wanted former Finance and National Planning minister Ng’andu Magande to stand as presidential candidate last year because he had promised to write off the debt. “I have a document to prove that Magande was going to allow them to get away with this money. The Post has attacked me from the time that you chose me as presidential candidate up to the time I became the president,” Mr. Banda said. The president said that The Post had always accused him of wanting to close the institution but it would close itself because of the debt owed to Zambian Airways. President Banda said that he did not have any intentions of closing any media institution even if people were to ask him to do so. “I have refused to do what they want me to do; they will be closed down by the debt they owe. I just want to say that this party was elected by people and it is internationally recognized,” Mr. Banda said. He said that he detested corruption and that was why he allowed the chief justice to set up a tribunal to investigate the conduct of Communications and Transport Minister, Dora Siliya. The president said that immediately he received the letter from the chief justice on the setting up of the tribunal, he instructed the treasury to ensure that funds were made available to enable it carry out its investigations smoothly. The president said The Post had always accused him of condoning corruption despite the fact that he was totally against it. He challenged the newspaper to transform into a political party so that it could compete with the rest on equal footing. Mr. Banda said that he would not tolerate corruption in his Government and would therefore not hesitate to part company with those perpetrating the vice. The president said Post Newspaper managing director, Fred Mmembe and Patriotic Front (PF) leader, Michael Sata had lately become close friends all for the sake of fighting his Government. “The Post has got to choose to remain a newspaper or a political party. I want to ask the party members to be vigilant and nobody should destabilize the peace. If Mr. Mmembe wanted the NGOs to audit him he should have done that earlier,” Mr. Banda said. The president said he respected Mr. Sata but the PF leader did not want to reciprocate that. “I took Sata as a friend, I did not know that he was a snake,” President Banda said. Earlier, MMD Lusaka provincial chairperson Cleopas Chimembe said that from the time Mr. Banda assumed office, he has exhibited high levels of tolerance even in the face of provocative actions and statements from opposition parties and other sections of society. He said that it was important that opposition parties and everybody else respected President Banda as the citizenry elected him. Mr. Chimembe warned that the MMD would not sit idle and watch Mr. Banda being insulted by citizens at will. “We appreciate the freedom of expression, but let us remind ourselves that this freedom is not absolute. Freedom is always relative. Absolute freedom is for dictators,” he said. He said despite the personal attacks on the president, the MMD would not lose track and fail to fulfill the promises made during the campaigns running to the last election. 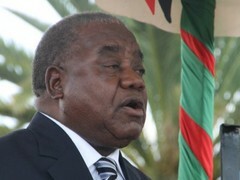 He said that the attacks would not destroy the resolve by President Banda to fulfill the promises. When are we going to have our own Obama at plot one? I mean an adult as Head of State who would treat us as adults. Mr President just in case you’ve forgotten how this saga started let me remind you. You are not the one who informed the public that Dora Siliya ignored the legal opinion of the chief govt adviser i.e the AG and signed a no bid MOU to value Zamtel. It was The Post Mr President. Sir you were more concerned with the leakage of this information than anything else. If you had your this information would have been kept out of the public domain. You are on record praising Dora’s intelliegence and that she had done nothing wrong. It is William Harrington who wrote to the Chief Justice requesting him to constitute a Tribunal. You Sir played no role in this other than rabidly attack those you perceive to be your enemies i.e Magande, Mmembe and The Post. Honestly Mr President you are no democrat. A democrat wouldnt hold a grudge against an opponent. You would think Magande committed high treason for merely aspiring to be President of his motherland. Look at the adult Obama. Isnt he serving his nation with joe Biden and Hillary Clinton? Two people who said unpleasant things about him in the primaries. Should Obama be wishing that something befalls Fox News Channel, the New York Post, Washington Times, Chicago Tribune etc because they dont support him? Comeon RP The Post has every right under the sun to either support you or even decampaign you. Welcome to a democratic and open society Mr President. Zambia has changed and you should learn to adapt to the times. Look at the brighter side of things, close to 2 million people buy the POST daily. If the POST is shut then we are talking about K 6bn savings a day, which transalates to about K 180bn a month. This should surely see us through this economic downturn and leave more money in our pockets. This is not to talk about the VX’s and GX’s that the government will be able to buy. This to me is just Obamas stimulus plan only done in the Bwezani style.